Spices: For years now I've been setting up all my spices in drawers instead of the traditional tiered rack in a cabinet. Mostly, that has to do with what cabinet and drawer space I have available in my kitchen. 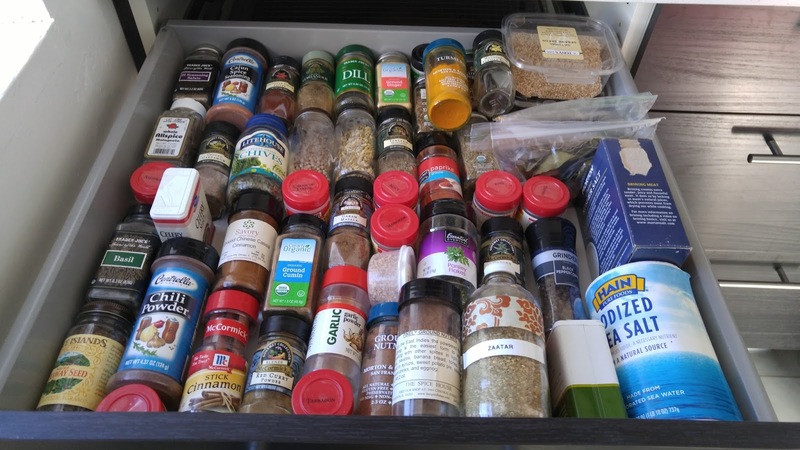 Notice that I've lined the spices in alphabetical order. It's the quickest way I can find what I'm looking for, instead of say, baking vs. cooking. Oddly shaped spices (boxes and bags) are set to one side to streamline the jars as best as possible. 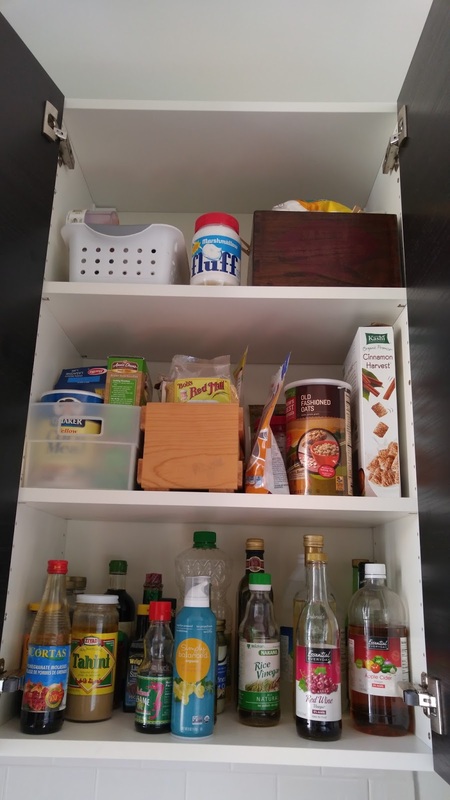 Food: This is one of my food cabinets; I don't have a pantry. On the top shelf are items I don't often grab. One bin has sprinkles, and one bin has baking extras like extracts and baking chips. The middle shelf houses items I reach for from time to time: one bin of pasta, one bin of other grains and cereals to the side. Below are all my oils, vinegars and sauces - things I reach for almost every day. Containers: Everyone asks. I personally stack like sized containers together with their lids inside. If I had the space I'd stack all the containers, lidded. But alas, I do not. separated different sizes of spoons and forks. It's easier for my tiny hands to grab the spoon I want this way! Baking: If you know me, you know I love to bake! 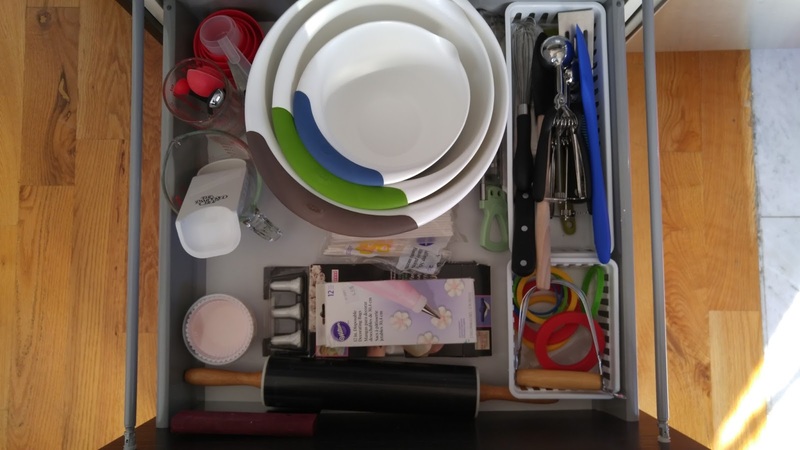 This drawer houses all my baking prep supplies. Measuring spoons and cups are nested together. 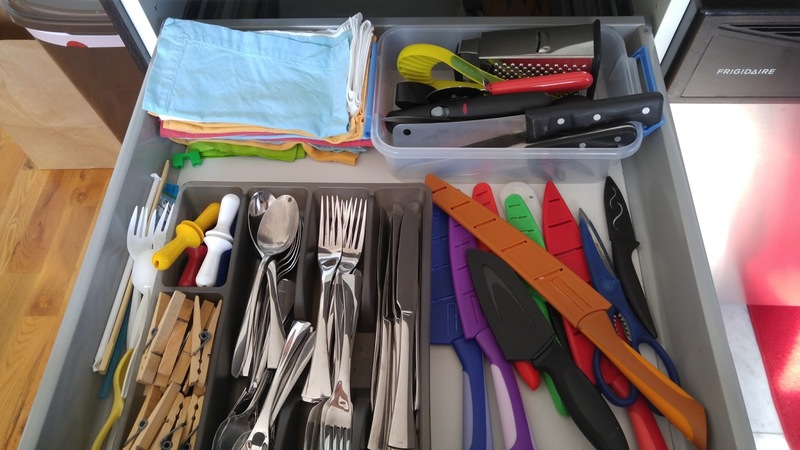 Utensils like spatulas and scoops are tossed together in the tray on the right. Bowls are nested, while small tools are gathered in the front right bin. FYI, those silicone rings are used on the rolling pin to create different thicknesses of dough. Awesome, right?! 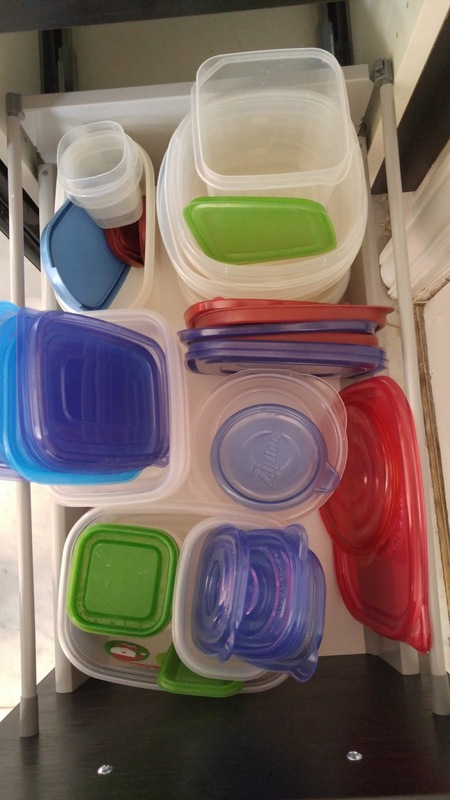 What's your organizing challenge in the kitchen?